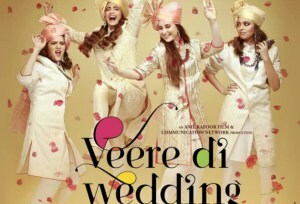 VEERE DI WEDDING is the story of four female friends at an uncertain age. Kalindi Puri (Kareena Kapoor Khan), Avni Sharma (Sonam Kapoor Ahuja), Sakshi Soni (Swara Bhasker) and Meera Sood (Shikha Talsania) are the best of pals. Avni is doing well professionally as a divorce lawyer but her mother (Neena Gupta) feels that it’s not all worth it unless she gets married. Sakshi is married and is facing tough times. Meera is married and also has a child and she is unhappy as her father has not accepted the union. Kalindi is dating Rishabh Malhotra (Sumeet Vyas) and all is going well in their relationship. But one day Rishabh proposes marriage. Kalindi says yes but she develops cold feet. Her marriage gets planned with much fanfare and it stresses her out. Of course her gang of friends assemble to be with her during the most significant period of her life, while battling their life problems. What happens next forms the rest of the film.